Although many of us think our dog is clever enough to understand us, this confidence has never been tested by science – until now. A new UK study found that dogs are more likely to steal food when they think you’re not looking, suggesting they understand our viewpoint. Dr. Juliane Kaminski of the University of Portsmouth’s department of psychology found that when a human forbids a dog from taking food, the dog is four times more likely to disobey in a dark room than a lit room, signifying dogs may take into account what humans can or cannot see. The results have scientists questioning whether dogs have a cognizant understanding of other species’ minds, an ability assumed limited only to humans. The research published in the journal Animal Cognition and funded by the Max Planck Society involved a series of experiments. In each test, a dog was forbidden by a human from taking food. When the room was dark, the dogs took more food and took it more quickly than when the room was lit. The tests were complex involving many variables to rule out the possibility that dogs were basing their decisions on simple associative rules, for example, that dark means food. In total, 42 female and 42 male domestic dogs aged one year or older took part in the tests. They were chosen only if they were comfortable without their owners in the room, even in complete darkness, and if they were interested in food. “The findings suggest that dogs are deciding that it’s safer to steal the food when the room is dark because they understand something of the human’s perspective,” Kaminski said. Another study on dog smarts conducted by Dr. Dominique Autier-Derian from the National Veterinary School in Lyon, France, found that dogs recognize their own species among other species on a computer screen. Dogs picked faces of other dogs, irrespective of breed, among human and other domestic and wild animal faces and even grouped them into categories. Autier-Derian studied this phenomenon among domestic dogs, which have the largest morphological variety among all animal species, with more than 400 registered dog breeds. The study explored whether this large morphological diversity presented a cognitive challenge to dogs trying to recognize their own species while confronted with other species using visual cues alone. On a computer screen, the researcher showed nine pet dogs pictures of faces from various dog breeds and cross-breeds and, simultaneously, faces of other animal species, including human faces. The results found dogs can form a visual category of dog faces and group pictures of very different dogs into a single category, despite the diversity in dog breeds. In fact, all nine dogs were able to group all the images of dogs within the same category. 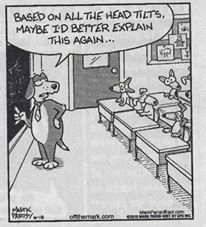 Here is the news flash: The research concluded that dogs learned to recognize their own species despite the diversity of breeds to insure mating between different breeds is always possible. This is hardly news to any animal shelter where on any given day many wonderful pure- and mixed-breed dogs are looking for that certain human face – yours – to take them home. This research also reminds us why we need to have our non-discriminating pets spayed or neutered. Dr. Allen explains that grief over the loss of a pet is normal and you shouldn’t be surprised if you feel devastated by your loss. Some people won’t understand your pain. Don’t let others dictate your feelings because your feelings are valid. Remember, you are not alone; thousands of pet owners have gone through these same feelings. Different people experience grief in different ways. Besides sorrow, you may also experience guilt, denial, anger and depression. Guilt comes from the “if only I had been more careful” syndrome. It is pointless to burden yourself with guilt because it only makes it more difficult to resolve your grief. 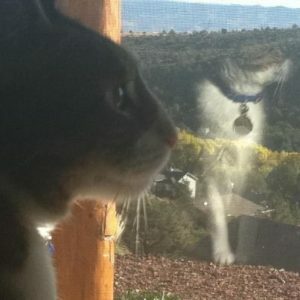 Denial results from the inability to adjust to the fact your pet really is gone. It’s hard to imagine he won’t greet you when you come home, or nudge you for his evening meal. Some pet owners find it hard to adopt a new pet for fear of being “disloyal” to the deceased pet. Anger may be directed at the illness that killed your pet, the driver of the speeding car, the veterinarian who “failed” to save his life. It is important that you don’t let anger distract you from the important task of resolving your grief. Depression is a natural consequence of grief, but it can leave you powerless to cope with your feelings. Extreme depression robs you of motivation and energy, causing you to dwell only upon your sorrow. It is important that you are honest with your feelings. Don’t deny your pain, or your anger and guilt. Only by examining and coming to terms with your feelings are you able to work through them. You have a right to feel pain and grief. Someone you loved has died, and you feel alone and bereaved. You have a right to feel anger and guilt, as well. Acknowledge your feelings, but then ask yourself whether the circumstances actually justify them. Locking away grief doesn’t make it go away. Express it. Cry, scream, pound the floor and talk it out. Do what helps you the most. Don’t try to avoid grief by not thinking about your pet; instead, reminisce about the good times. This will help you understand what your pet’s loss actually means to you. Some find it helpful to express their feelings and memories in poems, stories or letters to the pet. Other strategies include rearranging your schedule to fill the times you would have spent with your pet; preparing a memorial such as a photo collage; and talking to others about your loss. If your family or friends love pets, they’ll understand what you’re going through. Don’t hide your feelings in a misguided effort to appear strong. Working through your feelings with another person is one of the best ways to put them in perspective and find ways to handle them. Find someone you can talk to about how much your pet meant to you and how much you miss him – someone you feel comfortable crying and grieving with. If you don’t have family or friends who understand, or if you need more help, ask your veterinarian to recommend a pet loss counselor or support group. Check with your church or hospital for grief counseling. Remember, your grief is genuine and deserving of support. Nature Communications, a journal dedicated to publishing research in the biological, physical and chemical sciences released a report on January 29th, on the findings of a combined Smithsonian Conservation Biology Institute and Fish and Wildlife Service study. The results quickly became fodder for an uncritical media willing to accept its questionable claims. It is important to understand that this report does not rely on new research but a re-interpretation of previously published research. Although the authors claim their publication is a “systematic review,” the paper does not meet the standards for meta-analysis or systematic review. For example, the authors do not score the quality of the previous research they assessed or define the number of animals extrapolated in each paper. There is no correction factor to correlate the environments studied (urban vs. rural) with the actual land mass distribution of the US. Some of the papers cited simply restate or exaggerate data from other papers, so they are not even analyzing original data as meta-analysis/systematic review standards require. Sadly, there won’t be much opportunity for critical analysis because the authors elected to place their “results” in the mainstream media rather than submitting them for peer review. Clearly, this report was not written for scientists; it was written to misinform policy makers and the media. The study claims domestic cats in the United States kill a median of 2.4 billion birds and 12.3 billion mammals a year, most of them native mammals like shrews, chipmunks and voles rather than introduced pests like the Norway rat. This estimate is two to four times higher than mortality figures previously bandied about, making the domestic cat the single greatest human-linked threat to wildlife in the nation – greater than automobiles, pesticides and poisons, collisions with skyscrapers and windmills and other so-called anthropogenic causes. The results admittedly come with wide ranges and uncertainties but seem purposely designed to fuel the sometimes vitriolic debate between environmentalists who see free-roaming domestic cats as an invasive species and animal welfare advocates who are appalled by the millions of cats (and dogs) euthanized in animal shelters each year. Both sides do agree on two points; pet cats should not be allowed to prowl the neighborhood at will, any more than a dog, horse or potbellied pig, and cat owners who insist that their felines “deserve” a bit of freedom are both irresponsible and are not cat friendly. 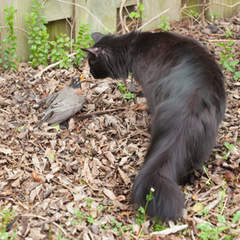 Recent projects like Kitty Cams at the University of Georgia, in which cameras are attached to the collars of indoor-outdoor pet cats to track their activities filmed cats not only preying on cardinals, frogs and field mice but also lapping up antifreeze and sewer sludge, dodging moving cars and sparring violently with large dogs. These are some of the reasons animal advocates claim that it is inhumane to let pet cats roam freely outdoors. The study takes lethal aim at feral cats, however, calling into question the efficacy of the Trap-Neuter-Return (TNR) methodology for controlling and decreasing feral cat populations. TNR is the practice of trapping, spaying and returning un-owned cats to a managed outdoor colony in the area from which they came. What the authors of the report failed to understand is that TNR is the only possible means for reducing the number of wildlife killed by feral cats. Although some communities try to employ eradication as a remedy, decades of such efforts across the United States has irrefutably demonstrated eradication does not work. 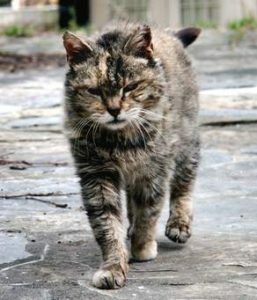 Feral cats have a strong biological survival drive; attempts to catch cats for extermination triggers two biological imperatives causing the surviving cats to both over-breed and over-produce. That is, instead of having one litter of two to three kittens per year, a stressed female will have two or three litters of six to nine kittens annually. Even if a community could catch and remove all their feral cats, a phenomenon called “the vacuum effect” quickly results in the neighboring cats entering the newly open territory bringing with them all the associated annoying behaviors, including an increase in wildlife killing. As we’ve seen time after time in location after location all over the country, the end result of “catch and kill” methodologies only exasperates the problem. That is, the vacated neighborhood swiftly finds itself overrun again with feral cats fighting and caterwauling for mates, over breeding, and spraying to mark their new territory. The only way to save our wildlife is to reduce the number of feral cats. The only known way to do that effectively is through well managed Trap/Neuter/Return programs.